DELAFIELD, Wis. (Stockpickr) -- There isn't a day that goes by on Wall Street when certain stocks trading for under $10 a share don't experience massive spikes higher. Traders savvy enough to follow the low-priced names and trade them with discipline and sod risk management are banking ridiculous coin on a regular basis. Just take a look at some of the big movers to the upside in the under-$10 complex from Wednesday, including EnerJex Resources (ENRJ , which soared higher by 32.5%; Joe's Jeans (JOEZ , which ripped higher by 23.6%; Entree Gold (EGI , which spiked higher by 23%; and Alexco Resource (AXU - Get Report) , which jumped higher by 20.5%. You don't even have to catch the entire move in lower-priced stocks such as these to make outsized returns when trading. 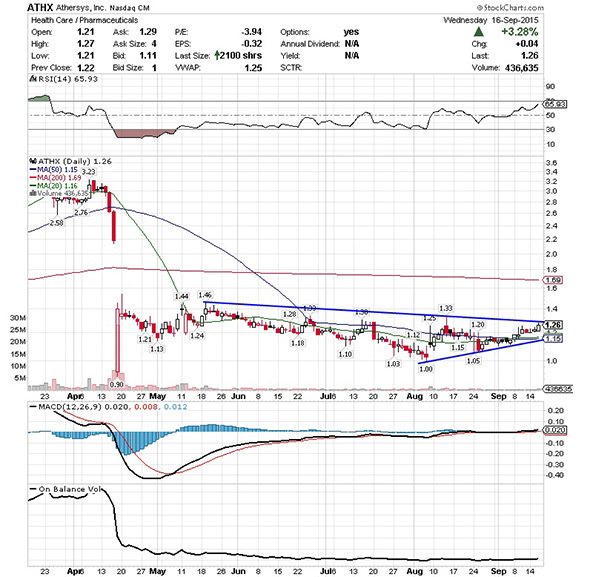 One under-$10 biotechnology player that's staring to spike within range of triggering big breakout trade is Athersys (ATHX - Get Report) , which , focuses on the research and development activities in the field of regenerative medicine. This stock has been destroyed by the sellers over the last six months, with shares down large by 57.7%. If you take a glance at the chart for Athersys, you'll notice that this stock spiked notably higher on Wednesday right above both its 50-day moving average of $1.15 and its 20-day moving average of $1.16 with strong upside volume flows. Volume on Wednesday registered over 436,000 shares, which is well above its three-month average action of 327,212 a shares. That spike is now quickly pushing shares of Athersys within range of triggering a big breakout trade above a key downtrend line that dates back to April. Market players should now look for long-biased trades in shares of Athersys if it manages to break out above that downtrend line that will trigger over some near-term resistance levels at $1.27 to $1.33 a share with high volume. Look for a sustained move or close above those levels with volume that hits near or above its three-month average action of 327,212 shares. If that breakout kicks off soon, then this stock will set up to re-test or possibly take out its next major overhead resistance levels at $1.46 to $1.54 a share. Any high-volume move above those levels will then give this stock a chance to re-fill some of its previous gap-down-day zone from April that started near $2.60 a share. Traders can look to buy this stock off weakness to anticipate that breakout and simply use a stop that sits right below its 50-day moving average of $1.15 a share or near more support at $1.10 a share. One can also buy shares of Athersys off strength once it starts to clear those breakout levels with volume and then simply use a stop that sits a comfortable percentage from your entry point. Another under-$10 energy player that's starting to spike within range of triggering a near-term breakout trade is Sanchez Energy (SN - Get Report) , which focuses on the acquisition, exploration, and development of unconventional oil and natural gas resources in the onshore U.S. Gulf Coast. This stock has been smacked lower by the bears over the last six months, with shares down sharply by 49.5%. If you take a look at the chart for Sanchez Energy, you'll notice that this stock ripped sharply higher on Wednesday back above its 20-day moving average of $5.85 a share with strong upside volume flows. Volume on Wednesday registered over 2.19 million shares, which is above its three-month average action of 2.15 million shares. 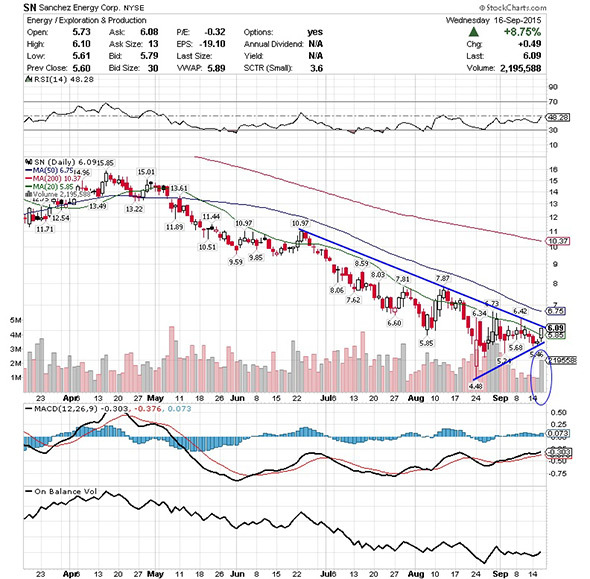 That strong spike to the upside is now quickly pushing shares of Sanchez Energy within range of triggering a big breakout trade above a key downtrend line that dates back to June. Market players should now look for long-biased trades in Sanchez Energy if it manages to break out above some key near-term overhead resistance levels at $6.42 to $6.73 a share and then above its 50-day moving average of $6.75 a share with high volume. Look for a sustained move or close above those levels with volume that registers near or above its three-month average action of 2.15 million shares. If that breakout materializes soon, then this stock will set up to re-test or possibly take out its next major overhead resistance levels at $7.87 to $8.03, or even $8.59 to $9 a share. Traders can look to buy this stock off weakness to anticipate that breakout and simply use a stop that sits right around its 20-day moving average of $5.85 or near more key support at $5.46 a share. One can also buy shares of Sanchez Energy off strength once it starts to take out those breakout levels with volume and then simply use a stop that sits a comfortable percentage from your entry point. 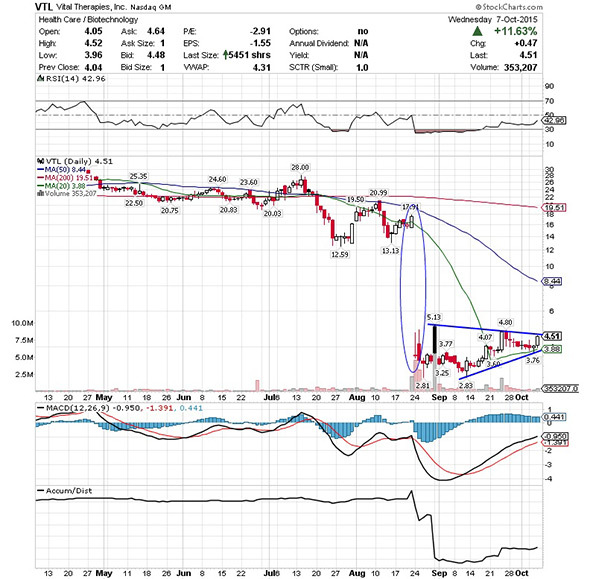 One under-$10 biotherapeutic player that's starting to trend within range of triggering a major breakout trade is Vital Therapies (VTL , which focuses on developing a cell-based therapy for the treatment of acute liver failure in the U.S. This stock has been decimated by the bears over the last three months, with shares down huge by 84.2%. If you take a glance at the chart for Vital Therapies, you'll notice that this stock recently gapped down sharply lower from around $18 a share to under $4 a share with heavy downside volume flows. Following that move, shares of Vital Therapies went on to form a double bottom chart pattern at $2.81 to $2.83 a share. This stock has now started to spike higher off those support levels and it's quickly moving within range of triggering a major breakout trade above some key near-term overhead resistance levels. Traders should now look for long-biased trades in Vital Therapies if it manages to break out above Wednesday's intraday high of $3.50 a share and then above more key resistance at $3.77 a share with high volume. Look for a sustained move or close above those levels with volume that hits near or above its three-month average action of 603,977 shares. If that breakout hits soon, then this stock will set up to re-test or possibly take out its next major overhead resistance levels at $5.13 to its 20-day moving average of $5.38 a share. Any high-volume move above those levels will then give this stock a chance to re-fill some of its previous gap-down-day zone from August that started near $18 a share. Traders can look to buy this stock off weakness to anticipate that breakout and simply use a stop that sits right around some near-term support at $3 a share or near those recent double bottom support levels. One can also buy shares of Vital Therapies off strength once it starts to trend above those breakout levels with volume and then simply use a stop that sits a comfortable percentage from your entry point. Another under-$10 technology player that's starting to spike within range of triggering a near-term breakout trade is Enphase Energy (ENPH - Get Report) , which, designs, develops, and sells microinverter systems for the solar photovoltaic industry in the U.S. and internationally. This stock has been slammed lower by the sellers over the last six months, with shares off large by 64.6%. If you look at the chart for Enphase Energy, you'll see that this stock has been downtrending badly for the last six months, with shares dropping sharply from over $14 a share to its new 52-week low of $3.90 a share. During that downtrend, shares of Enphase Energy have been consistently making lower highs and lower lows, which is bearish technical price action. That said, this stock has now started to rebound higher off that $3.90 low and it's quickly moving within range of triggering a near-term breakout trade above some key overhead resistance levels. Market players should now look for long-biased trades in Enphase Energy if it manages to break out above some near-term overhead resistance levels at $4.78 to $4.82 a share and then above more resistance at $4.89 a share with high volume. Look for a sustained move or close above those levels with volume that registers near or above its three-month average action of 905,305 shares. If that breakout gets started soon, then this stock will set up to re-test or possibly take out its next major overhead resistance levels at $5.26 to its 50-day moving average of $5.40 a share, or even $6 to $7 a share. 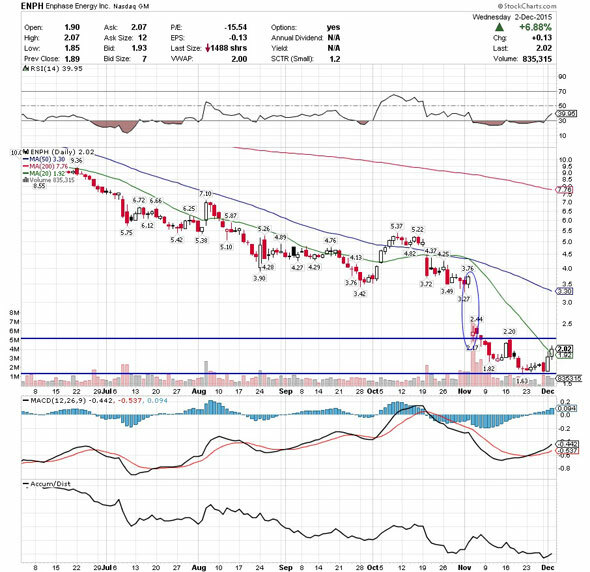 Traders can look to buy Enphase Energy off weakness to anticipate that breakout and simply use a stop that sits right around some key near-term support at $4.27 a share or around its new 52-week low of $3.90 a share. One can also buy this stock off strength once it starts to bust above those breakout levels with volume and then simply use a stop that sits a comfortable percentage from your entry point. One final under-$10 energy player that's starting to trend within range of triggering a big breakout trade is Breitburn Energy Partners (BBEP , which acquires, exploits, and develops oil, natural gas liquids , and natural gas properties in the U.S. This stock has been smoked by the sellers over the last three months, with shares down big by 52.5%. If you take a glance at the chart for Breitburn Energy Partners, you'll notice that this stock ripped higher on Wednesday right above some near-term support at $2.35 and back above its 20-day moving average of $2.53 a share with decent upside volume flows. 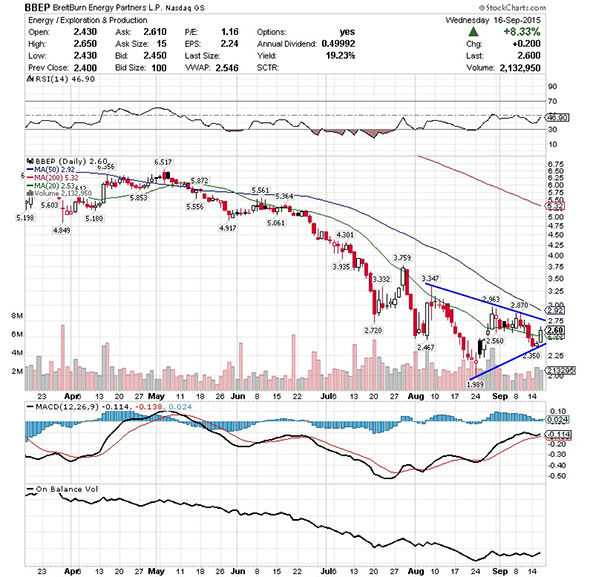 This strong move to the upside on Wednesday is now quickly pushing shares of Breitburn Energy Partners within range of triggering a big breakout trade above a key downtrend line that dates back to the start of August. Traders should now look for long-biased trades in Breitburn Energy Partners if it manages to break out above some near-term overhead resistance levels at $2.87 to its 50-day moving average of $2.92 a share and then above more key resistance levels at $2.96 to $3 a share with high volume. Look for a sustained move or close above those levels with volume that hits near or above its three-month average action of 2.36 million shares. If that breakout develops soon, then this stock will set up to re-test or possibly take out its next major overhead resistance levels at $3.35 to $3.75, or even $4 to $4.30 a share. Traders can look to buy shares of Breitburn Energy Partners off weakness to anticipate that breakout and simply use a stop that sits right around some key near-term support levels at $2.35 to $2.25 a share. One can also buy this stock off strength once it starts to move above those breakout levels with volume and then simply use a stop that sits a comfortable percentage from your entry point.